I will only admit this to a group of viral strangers once, and maybe this will cause outrage and disowning or maybe you’re sitting there nodding your head in disappointed agreement, but I’m originally from the USA. Not only do I despise calling it “the USA”, I’m also exhausted to the core of defending calling myself “American”. It is not my fault that my country never established some other name that could end in -ish, -i, -ese, -ian, -ic, etc., etc. Further, Canada = Canadians, Mexico = Mexicans, and don’t even get me started on the many, many countries within South and Central America that have their own suffixes. Having been away from “my” country for a substantial period of time, I not only find myself relating less and less to my compatriots, I also quickly find myself exhausted with their behaviour, comments, arrogance, and ignorance. For much longer than I’ve been away, I’ve considered myself a citizen of the world; but the world’s other citizens never cease to remind me of my roots. Thanks for that; how dare I nearly forget? And here we are, in the midst of the Olympics, and I’m supposed to inherently care about the US teams. Admittedly, I don’t care for the Olympics outside of a very few, select events in the first place, but I suppose it’s a nice time to show national pride, even when your country is already blamed for being entirely too nationalistic as it is. Just a reminder, friends: nationalism and patriotism are different. I’m happy to be United States-ish for all of the opportunities I am afforded (and therefore am patriotic); however, I do not dislike any other countries or their people for any reason, nor do I think my country is superior to others (and am, therefore, not nationalistic). Look it up. Encaustic, oil, and collage on fabric mounted on plywood, three panels, 107.3 x 153.8 cm. Oil on canvas, 198.2 x 314.7 cm. The Whitney Museum, a United States-ic museum of United States-ese art, is exhibiting strong United States-i artists and their strong patriotic images. Bake an apple pie and leave it to cool while you get yourself over there to restore your own patriotism. While you’re at it, check out a Yankee (or Mets if you must) game. 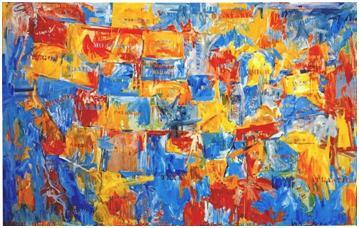 For entertainment on the subway ride, be sure to procure this beautifully illustrated ebook: Jasper Johns. 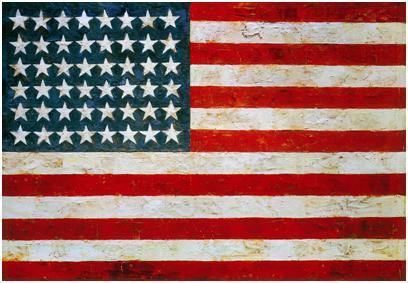 Next Entry Jasper Johns – symbole de la fierté américaine ?